The Supreme Court in M. S. KAZI VS. MUSLIM EDUCATION SOCIETY held that all Tribunals are not necessary parties in a Special Civil Applications under Articles 226 and 227 of the Constitution, when they are not required to defend its orders when they are challenged before the High Court. The Supreme Court, in BEATA AGNIESZKA SOBIERAJ VS. STATE OF HIMACHAL PRADESH depreciated the practice of handing over the custody of the child to an institution, while ignoring the claim of a parent, especially the mother of the child, as not acceptable. The Supreme Court in ACC Ltd. vs. State of Kerala reiterated that, sales at the hands of the brand name holder and trade mark holder would be treated as the first sale for assessing tax under Kerala General Sales Tax Act, 1963. The Supreme Court in State of Haryana vs. Ram Mehar & Others held that, recalling of witnesses as envisaged under Section 311 of the Code of Criminal Procedure on the grounds that accused persons are in custody, the prosecution was allowed to recall some of its witnesses earlier, the counsel was ill and magnanimity commands fairness should be shown, is not acceptable. The Apex Court in Sasan Power Limited vs. North American Coal Corporation India Private Limited, held that the scope of enquiry under the Section 8 and Section 45 of the Arbitration and Conciliation Act, 1996, is confined only to the question whether the arbitration agreement is “null and void, inoperative or incapable of being performed” but not the legality and validity of the substantive contract. Partly allowing the appeal by Madhya Pradesh MLA Sri. Ajay Arjun Singh, the Supreme Court in Ajay Arjun Singh vs. Sharadendu Tiwari held that, use of Helicopters by ‘star campaigners’ of election, for travelling outside their constituencies, cannot be included in their election expenditure. Apex Court Bench comprising of Justices J. Chelameswar and Abhay Manohar Sapre, also held that a ‘Star campaigner’ is under no legal obligation to make any declaration of the expenditure incurred by him in connection with meeting held outside the constituency he contests. The Supreme Court, in JAYAM & CO. VS. ASSISTANT COMNMISSIONER & ANR has struck down retrospective effect given to sub-section (20) of Section 19, of the Tamil Nadu Value Added Tax Act, 2006. The Supreme Court on Monday, agreed to hear next Monday the petition filed by Gujarat Government challenging the state High Court order that quashed its ordinance providing 10% quota for the economically backward among the unreserved category, including the agitating Patel community. Tamil Nadu Chief Minister J Jayalalithaa once again faced the ire of Supreme Court for slapping defamation cases against political opponents. “If you are a public figure, you have to get used to criticism. Perhaps Tamil Nadu is the only state which misuses state machinery to fight defamation cases.” the bench said. The Supreme Court bench on Tuesday, directed State Pollution Control Boards in Haryana, Rajasthan, Madhya Pradesh, Pondicherry, Jharkhand and Delhi, to inspect the quartz-grinding units in their States within three weeks. The Supreme Court does not have a magic wand to create a Ram Rajya (ideal state), Chief Justice T S Thakur on Friday told a petitioner in a public interest litigation who wanted a blanket order directing authorities all over the country to remove encroachments from footpaths. The Supreme Court in JAMSHED ANSARI VS. HIGH COURT OF JUDICATURE AT ALLAHABAD & ORS held that right of Advocates to appear and conduct cases in the court is a matter on which the court must and does have major supervisory and controlling power and it cannot be and are not divested of control or supervision of conduct in court merely because it may involve the right of an Advocate. The Chief Justice T S Thakur-led bench told J & K Panthers Party chief and lawyer Bhim Singh on Monday that the Supreme Court can do precious little to solve the law and order issues in Jammu and Kashmir and its best resolved through political dialogue of the kind happening between the Prime Minister and the Opposition parties. The Supreme Court ordered the Central Board of Secondary Education (CBSE) to “scrupulously” follow its 2011 judgment which had ruled that students have fundamental and legal right of having access to answer sheets under Right to Information Act, 2005. The Supreme Court on Friday issued notices to Ministries of Women and Child Development, Law and Justice, Minority Affairs and the National Commission for Women on a petition filed by a Muslim woman divorced by her husband through a phone call from Dubai, challenging validity of Muslim practices of polygamy, triple talaq (talaq-e-bidat) and nikahhalala. Supreme Court directed the Allahabad High Court to dispose of the Habeas Corpus Petition filed against alleged illegal detention of Kamlesh Tiwari under National Security Act, within four weeks. A Public interest Litigation (PIL) was filed in Supreme Court seeking the implementation of directions issued by the Supreme Court in Prakash Singh Case related to Police Reforms. The Petition filed by BJP leader and Delhi based lawyer Ashwini Kumar Upadhya also sought the implementation of Model Police Act 2006. The Apex Court on Friday pulled up Jammu and Kashmir Panthers Party chief Bhim Singh who has filed a petition seeking Governor’s rule in the strife torn state for not filing a proper response to the status report filed by the Centre and asked him to spend a week in Kashmir and submit a ground report about the state and the prevailing situation. A two Judge Bench of the Supreme Court on Friday, observed that the punishment provided under Section 304A of Indian Penal Code for ‘causing death by negligence’ is absolutely inadequate. The Supreme Court is set to hear the self-styled godman, AsaramBapu’s application for regular bail on medical grounds on August 29. 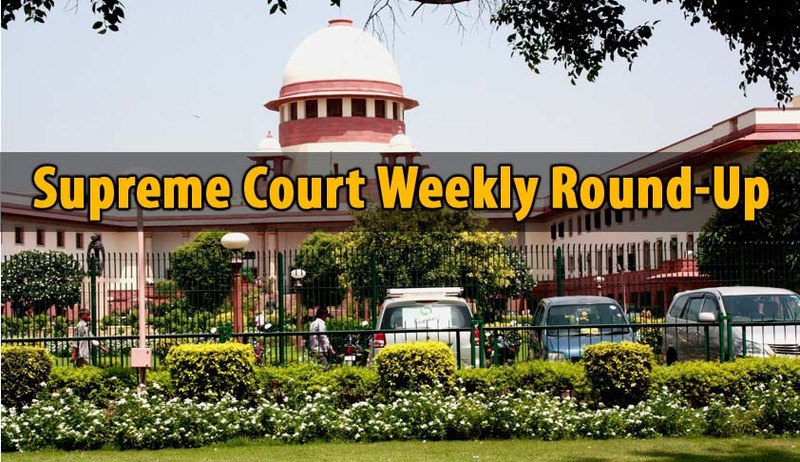 The matter is listed before the bench at Court No.11, before justices A.K.Sikri and N.V.Ramana, although it was the bench comprising Madan B Lokur and R.K.Agrawal which had heard the matter earlier, and directed its listing on August 29. The sudden change in the bench hearing the matter has surprised observers. Rahul Gandhi’s lawyer KapilSibal told the Supreme Court that the Congress Vice President never blamed RSS as an institution for the assassination of Mahatma Gandhi and he only referred to some individuals in that organization.